This article is a non-technical introduction to the subject. For the main encyclopedia article, see Design of the FAT file system. FAT16: 0x 04 0x06 0x0E e.a. FAT32: 0x 0B 0x0C e.a. File Allocation Table (FAT) is a computer file system architecture and a family of industry-standard file systems utilizing it. The FAT file system is a continuing standard which borrows source code from the original, legacy file system and proves to be simple and robust. It offers useful performance even in lightweight implementations, but cannot deliver the same performance, reliability and scalability as some modern file systems. It is, however, supported for compatibility reasons by nearly all currently developed operating systems for personal computers and many mobile devices and embedded systems, and thus is a well-suited format for data exchange between computers and devices of almost any type and age from 1981 up to the present. In computing, a legacy system is an old method, technology, computer system, or application program, "of, relating to, or being a previous or outdated computer system," yet still in use. Often referencing a system as "legacy" means that it paved the way for the standards that would follow it. This can also imply that the system is out of date or in need of replacement. Originally designed in 1977 for use on floppy disks, FAT was soon adapted and used almost universally on hard disks throughout the DOS and Windows 9x eras for two decades. As disk drives evolved, the capabilities of the file system have been extended accordingly, resulting in three major file system variants: FAT12, FAT16 and FAT32. The FAT standard has also been expanded in other ways while generally preserving backward compatibility with existing software. A hard disk drive (HDD), hard disk, hard drive, or fixed disk, is an electromechanical data storage device that uses magnetic storage to store and retrieve digital information using one or more rigid rapidly rotating disks (platters) coated with magnetic material. The platters are paired with magnetic heads, usually arranged on a moving actuator arm, which read and write data to the platter surfaces. Data is accessed in a random-access manner, meaning that individual blocks of data can be stored or retrieved in any order and not only sequentially. HDDs are a type of non-volatile storage, retaining stored data even when powered off. DOS is a family of disk operating systems, hence the name. DOS primarily consists of MS-DOS and a rebranded version under the name IBM PC DOS, both of which were introduced in 1981. Other later compatible systems from other manufacturers include DR-DOS (1988), ROM-DOS (1989), PTS-DOS (1993), and FreeDOS (1998). MS-DOS dominated the x86-based IBM PC compatible market between 1981 and 1995. Microsoft Windows is a group of several graphical operating system families, all of which are developed, marketed, and sold by Microsoft. Each family caters to a certain sector of the computing industry. Active Windows families include Windows NT and Windows Embedded; these may encompass subfamilies, e.g. Windows Embedded Compact or Windows Server. Defunct Windows families include Windows 9x, Windows Mobile and Windows Phone. FAT file systems are still commonly found on floppy disks, flash and other solid-state memory cards and modules (including USB flash drives), as well as many portable and embedded devices. FAT is the standard file system for digital cameras per the DCF specification. Solid-state storage is a type of non-volatile computer storage that stores and retrieves digital information using only electronic circuits, without any involvement of moving mechanical parts. This differs fundamentally from the traditional electromechanical storage, which records data using rotating or linearly moving media coated with magnetic material. The name of the file system originates from the file system's prominent usage of an index table, the File Allocation Table (FAT), statically allocated at the time of formatting. The table contains entries for each cluster , a contiguous area of disk storage. Each entry contains either the number of the next cluster in the file, or else a marker indicating end of file, unused disk space, or special reserved areas of the disk. The root directory of the disk contains the number of the first cluster of each file in that directory; the operating system can then traverse the FAT, looking up the cluster number of each successive part of the disk file as a cluster chain until the end of the file is reached. In much the same way, sub-directories are implemented as special files containing the directory entries of their respective files. Originally designed as an 8-bit file system, the maximum number of clusters has been significantly increased as disk drives have evolved, and so the number of bits used to identify each cluster has grown. The successive major variants of the FAT format are named after the number of table element bits: 12 (FAT12), 16 (FAT16), and 32 (FAT32). Except for the original 8-bit FAT precursor, each of these variants is still[ when? ] in use. The FAT standard has also been expanded in other ways while generally preserving backward compatibility with existing software. The FAT file system has a long history (over three decades) of usage on desktops and portable computers, and it is frequently used in embedded solutions. FAT offers reasonably good performance and robustness, even in very light-weight implementations. It is therefore widely adopted and supported by virtually all existing operating systems for personal computers as well as some home computers and a multitude of embedded systems. This also makes it a useful format for solid-state memory cards and a convenient way to share data between operating systems. FAT file systems are the default file system for removable media (with the exception of CDs and DVDs) and as such are commonly found on floppy disks, super-floppies, memory and flash memory cards or USB flash drives and are supported by most portable devices such as PDAs, digital cameras, camcorders, media players, or mobile phones. While FAT12 is omnipresent on floppy disks, FAT16 and FAT32 are typically found on the larger media. FAT was also commonly used on hard disks throughout the DOS and Windows 9x eras, but its use on hard drives has declined since the introduction of Windows XP, which primarily uses the newer NTFS. FAT is still used in hard drives expected to be used by multiple operating systems, such as in shared Windows, GNU/Linux and DOS environments. Due to the widespread use of FAT-formatted media, many operating systems provide support for FAT through official or third-party file system handlers. For example, OS/2, GNU/Linux, FreeBSD and BeOS provide built-in support for FAT, even though they also support more sophisticated file systems such as ext4 or btrfs. Mac OS 9 and macOS support FAT file systems on volumes other than the boot disk. AmigaOS supports FAT through the CrossDOS package. For many purposes, the NTFS file system is superior to FAT in terms of features and reliability; its main drawbacks are its complexity and the size overhead for small volumes as well as the very limited support by anything other than the NT-based versions of Windows, since the exact specification is a trade secret of Microsoft. The availability of NTFS-3G since mid-2006 has led to much improved NTFS support in Unix-like operating systems, considerably alleviating this concern. It is still not possible to use NTFS in DOS-like operating systems without third-party drivers, which in turn makes it difficult to use a DOS floppy for recovery purposes. Microsoft provided a Recovery Console to work around this issue, but for security reasons it severely limited what could be done through the Recovery Console by default. The movement of recovery utilities to boot CDs based on BartPE, Linux (with NTFS-3G), or WinPE is eroding this drawback, but the complexity of NTFS prevents its implementation in light-weight operating systems or most embedded systems. Hidden FAT filesystems are also used in the UEFI boot partition on modern PC's where the UEFI specification requires compliant firmware to be capable of reading FAT12, FAT16 and FAT32 compliant partitions. Technically, the term "FAT file system" refers to all three major variants of the file system, FAT12, FAT16 and FAT32, and most parties clearly distinguish between them where necessary. In contrast to this, Microsoft typically no longer distinguishes between all three of them since the introduction of FAT32, and refers to both FAT12 and FAT16 as "FAT", whereas "FAT32" gets treated specially in dialog boxes and documentation. This can sometimes lead to confusion if the actual type of the file system used is not mentioned or cannot be explicitly specified (e.g., "Do you want to format as FAT or FAT32?" instead of "Do you want to format as FAT12, FAT16 or FAT32?"). Another common cause of confusion exists within the group of FAT16 file systems, since the term "FAT16" refers to both, either the whole group of FAT file systems with 16-bit wide cluster entries, or specifically only the original implementation of it with 16-bit sector entries, when it becomes necessary to differentiate between the original and the later implementation. While technically the newer variant with 32-bit sector entries is called "FAT16B", it is commonly referred to under the name "FAT16" as well, in particular since the original variant is rarely seen today and typically only used on small media when backward compatibility with DOS before 3.31 is required. Further, the term "VFAT" has led to various misconceptions as well, [nb 2] as it is sometimes erroneously used as if it would describe another variant of FAT file system to be distinguished from the FAT12, FAT16 and FAT32 file systems, while in reality it does not specify another file system, but an optional extension, which can work on top of any FAT file system, FAT12, FAT16 or FAT32. Volumes utilizing VFAT long-filenames can be read also by operating systems not supporting the VFAT extension, as long any operating systems that support the underlying file system (FAT12, FAT16, or FAT32). Yet another cause for misconceptions stems from some apparent redundancy and possible ambiguity in the definition of FAT volumes. The general type of file system (FAT12, FAT16 or FAT32) is determined by the width of the cluster entries in the FAT. Specific threshold values for the amount of clusters  (as stored in the BPB) have been defined to determine which FAT type is used. Even though other properties such as the size of the volume, the count of sectors, the BPB format, the file system name in an EBPB, or -in case of partitioned media- the used partition ID may often seem to be well-suited distinguishing criteria as well, they cannot reliably be used to derive the file system type from in all scenarios. Whilst uncommon, it is technically possible to define a FAT12 or FAT16 volume using a "FAT32 EBPB" (which is sort of a misnomer for the EBPB variant introduced with DOS 7.1), which is normally used for FAT32 volumes, only. [nb 3] Also, while partition IDs sometimes indicate special properties such as hidden, secure, CHS or LBA access to an operating system, and as such are often used in conjunction with particular file system variants only, they are typically not used to specify a type of file system by themselves, but rather to keep (older or foreign) operating systems not aware of a partition ID from accessing partitions they cannot handle or should not work with. It is therefore necessary to distinguish generic FAT file system types such as FAT12, FAT16 or FAT32 from FAT partition types such as FAT12, FAT16, FAT16B, FAT16X, FAT32, FAT32X etc. The original FAT file system (or FAT structure, as it was called initially) was designed and coded by Marc McDonald,  based on a series of discussions between McDonald and Bill Gates. It was introduced with 8-bit table elements    (and valid data cluster numbers up to 0xBF   ) in a precursor to Microsoft's Standalone Disk BASIC-80 for an 8080-based successor [nb 4] of the NCR 7200 model VI data-entry terminal, equipped with 8-inch (200 mm) floppy disks, in 1977  or 1978. [nb 4] In 1978,Standalone Disk BASIC-80 was ported to the 8086 using an emulator on a DEC PDP-10,  since no real 8086 systems were available at this time. The FAT file system was also utilized in Microsoft's MDOS/MIDAS,  an operating system for 8080/Z80 platforms written by McDonald since 1979. The Standalone Disk BASIC version supported three FATs,    whereas this was a parameter for MIDAS. Reportedly, MIDAS was also prepared to support 10-bit, 12-bit and 16-bit FAT variants. While the size of directory entries was 16 bytes in Standalone Disk BASIC,   MIDAS instead occupied 32 bytes per entry. Between April and August 1980, while borrowing the FAT concept for SCP's own 8086 operating system QDOS 0.10,  Tim Paterson extended the table elements to 12 bits,  reduced the number of FATs to two, redefined the semantics of some of the reserved cluster values, and modified the disk layout, so that the root directory was now located between the FAT and the data area for his implementation of FAT12. Paterson also increased the nine-character (6.3) filename   length limit to eleven characters in order to support CP/M-style 8.3 filenames and File Control Blocks. 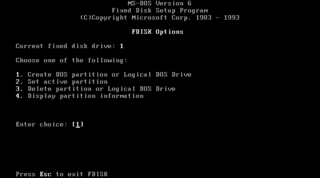 The format used in Microsoft Standalone Disk BASIC's 8-bit file system precursor was not supported by QDOS. By August 1980, QDOS had been already renamed 86-DOS. Starting with 86-DOS 0.42, the size and layout of directory entries was changed from 16 bytes to 32 bytes  in order to add a file date stamp  and increase the theoretical file size limit beyond the previous limit of 16 MB. 86-DOS 1.00 became available in early 1981. Later in 1981, 86-DOS evolved into Microsoft's MS-DOS and IBM PC DOS. The capability to read previously formatted volumes with 16-byte directory entries  was dropped with MS-DOS 1.20. By convention, all the control structures were organized to fit inside the first track, thus avoiding head movement during read and write operations, although this varied depending on the manufacturer and physical format of the disk. A limitation which was not addressed until much later (with FAT32) was that any bad sector in the control structures area, track 0, could prevent the disk from being usable. The DOS formatting tool rejected such disks completely. Bad sectors were allowed only in the file data area and (since DOS 2.0) were marked with the reserved value 0xFF7 in the FAT. They made the entire containing cluster unusable. While 86-DOS supported three disk formats (250.25 KiB, 616 KiB and 1232 KiB with FAT IDs 0xFF and 0xFE) on 8-inch (200 mm) floppy drives, IBM PC DOS 1.0, released with the original IBM Personal Computer in 1981, supported only an 8-sector floppy format with a formatted capacity of 160 KiB (FAT ID 0xFE) for single-sided 5.25-inch floppy drives, and PC DOS 1.1 added support for a double-sided format with 320 KiB (FAT ID 0xFF). PC DOS 2.0 introduced support for 9-sector floppy formats with 180 KiB (FAT ID 0xFC) and 360 KiB (FAT ID 0xFD). 86-DOS 1.00 and PC DOS 1.0 directory entries included only one date, the last modified date. PC DOS 1.1 added the last modified time. PC DOS 1.x file attributes included a hidden bit and system bit, with the remaining six bits undefined. At this time, DOS did not support a hierarchical file system, which was still acceptable, given that the number of files on a disk was typically not more than a few dozen. The PC XT was the first PC with a hard drive from IBM, and PC DOS 2.0 supported that hard drive with FAT12 (FAT ID 0xF8). The fixed assumption of 8 sectors per clusters on hard disks practically limited the maximum partition size to 16 MiB for 512 byte sectors and 4 KiB clusters. MS-DOS 3.0 introduced support for high-density 1.2 MiB 5.25-inch diskettes (media descriptor 0xF9), which notably had 15 sectors per track, hence more space for the FATs. FAT12 remains in use on all common floppy disks, including 1.44 MiB and later 2.88 MiB disks (media descriptor byte 0xF0). On August 14, 1984, IBM released the PC AT, which featured a 20 MiB hard disk and PC DOS 3.0. Microsoft introduced MS-DOS 3.0 in parallel. Cluster addresses were increased to 16-bit, allowing for up to 65,524 clusters per volume, and consequently much greater file system sizes, at least in theory. However, the maximum possible number of sectors and the maximum (partition, rather than disk) size of 32 MiB did not change. Therefore, although cluster addresses were 16 bits, this format was not what today is commonly understood as FAT16. A partition type 0x04 indicates this form of FAT16 with less than 65536 sectors (less than 32 MiB for sector size 512). With the initial implementation of FAT16 not actually providing for larger partition sizes than FAT12, the early benefit of FAT16 was to enable the use of smaller clusters, making disk usage more efficient, particularly for large numbers of files only a few hundred bytes in size. As MS-DOS 3.0 and higher formatted all 16 MiB-32 MiB partitions in the FAT16 format, a 20 MiB hard disk formatted under MS-DOS 3.0 was not accessible by the older MS-DOS 2.0 although MS-DOS 2.0 was able to access 16 MiB-32 MiB FAT12 partitions  . MS-DOS 3.0 to MS-DOS 3.30 could still access FAT12 partitions under 15 MiB but required all 16 MiB-32 MiB partitions to be FAT16, and so failed to access MS-DOS 2.0 partitions in this size range. MS-DOS 3.31 and higher could access 16 MiB-32 MiB FAT12 partitions again. Some vendors (AST and NEC  ) supported eight, instead of the standard four, primary partition entries in their custom extended Master Boot Record (MBR), and they adapted MS-DOS to use more than a single primary partition. Other vendors worked around the volume size limits imposed by the 16-bit sector entries and arithmetics by increasing the size of the sectors the file system dealt with, thereby blowing up dimensions. These so-called logical sectors were larger (up to 8192 bytes) than the physical sector size (still typically 512 bytes) as expected by the ROM-BIOS INT 13H or the disk drive hardware. The DOS-BIOS or System BIOS would then combine multiple physical sectors into logical sectors for the file system to work with. These changes were transparent to the file system implementation in the DOS kernel, since on the file system's abstraction level volumes are seen as a linear series of logically addressable sectors, also known as absolute sectors (addressed by their Logical Sector Number (LSN), starting with LSN 0) independent of the physical location of the volume on the physical medium and its geometry. The underlying DOS-BIOS translated these logical sectors into physical sectors according to partitioning information and the drive's physical geometry. While non-standard and sub-optimal, these FAT variants are perfectly valid according to the specifications of the file system itself. Therefore, even if default issues of MS-DOS and PC DOS were not able to cope with them, most of these vendor-specific FAT12 and FAT16 variants can be mounted by more flexible file system implementations in operating systems such as DR-DOS, simply by changing the partition ID to one of the recognized types. [nb 6] Also, if they no longer need to be recognized by their original operating systems, existing partitions can be "converted" into FAT12 and FAT16 volumes more compliant with versions of MS-DOS/PC DOS 4.0–6.3, which do not support sector sizes different from 512 bytes,  by switching to a BPB with 32-bit entry for the number of sectors, as introduced since DOS 3.31 (see FAT16B below), keeping the cluster size and reducing the logical sector size in the BPB down to 512 bytes, while at the same time increasing the counts of logical sectors per cluster, reserved logical sectors, total logical sectors, and logical sectors per FAT by the same factor. A parallel development in MS-DOS / PC DOS which allowed an increase in the maximum possible FAT size was the introduction of multiple FAT partitions on a hard disk. To allow the use of more FAT partitions in a compatible way, a new partition type was introduced in PC DOS 3.2 (1986), the extended partition (EBR),  which is a container for an additional partition called logical drive. Since PC DOS 3.3 (April 1987), there is another, optional extended partition containing the next logical drive, and so on. The MBR of a hard disk can either define up to four primary partitions, or an extended partition in addition to up to three primary partitions. FAT16B: 0x 06 0x0E (LBA), e.a. In November 1987, Compaq Personal Computer DOS 3.31 (a modified OEM version of MS-DOS 3.3 released by Compaq with their machines) introduced what today is simply known as the FAT16 format, with the expansion of the 16-bit disk sector count to 32 bits in the BPB. Although the on-disk changes were minor, the entire DOS disk driver had to be converted to use 32-bit sector numbers, a task complicated by the fact that it was written in 16-bit assembly language. The result was initially called the DOS 3.31 Large File System. Microsoft's DSKPROBE tool refers to type 0x06 as BigFAT,  whereas some older versions of FDISK described it as BIGDOS. Technically, it is known as FAT16B. Since older versions of DOS were not designed to cope with more than 65535 sectors, it was necessary to introduce a new partition type for this format in order to hide it from pre-3.31 issues of DOS. The original form of FAT16 (with less than 65536 sectors) had a partition type 0x04 . To deal with disks larger than this, type 0x06 was introduced to indicate 65536 or more sectors. In addition to this, the disk driver was expanded to cope with more than 65535 sectors as well. The only other difference between the original FAT16 and the newer FAT16B format is the usage of a newer BPB format with 32-bit sector entry. Therefore, newer operating systems supporting the FAT16B format can cope also with the original FAT16 format without any necessary changes. If partitions to be used by pre-DOS 3.31 issues of DOS need to be created by modern tools, the only criteria theoretically necessary to meet are a sector count of less than 65536, and the usage of the old partition ID ( 0x04 ). In practice however, type 0x01 and 0x04 primary partitions should not be physically located outside the first 32 MiB of the disk, due to other restrictions in MS-DOS 2.x, which could not cope with them otherwise. In 1988, the FAT16B improvement became more generally available through DR DOS 3.31, PC DOS 4.0, OS/2 1.1, and MS-DOS 4.0. The limit on partition size was dictated by the 8-bit signed count of sectors per cluster, which originally had a maximum power-of-two value of 64. With the standard hard disk sector size of 512 bytes, this gives a maximum of 32 KiB cluster size, thereby fixing the "definitive" limit for the FAT16 partition size at 2 GiB for sector size 512. On magneto-optical media, which can have 1 or 2 KiB sectors instead of 0.5 KiB, this size limit is proportionally larger. Much later, Windows NT increased the maximum cluster size to 64 KiB, by considering the sectors-per-cluster count as unsigned. However, the resulting format was not compatible with any other FAT implementation of the time, and it generated greater internal fragmentation. Windows 98, SE and ME also supported reading and writing this variant, but its disk utilities did not work with it and some FCB services are not available for such volumes. This contributes to a confusing compatibility situation. Prior to 1995, versions of DOS accessed the disk via CHS addressing only. When MS-DOS 7.0 / Windows 95 introduced LBA disk access, partitions could start being physically located outside the first ca. 8 GiB of this disk and thereby out of the reach of the traditional CHS addressing scheme. Partitions partially or fully located beyond the CHS barrier therefore had to be hidden from non-LBA-enabled operating systems by using the new partition type 0x0E in the partition table instead. FAT16 partitions using this partition type are also named FAT16X. The only difference, compared to previous FAT16 partitions, is the fact that some CHS-related geometry entries in the BPB record, namely the number of sectors per track and the number of heads, may contain no or misleading values and should not be used. FAT32: 0x 0B 0x0C (LBA), e.a. In order to overcome the volume size limit of FAT16, while at the same time allowing DOS real-mode code to handle the format, Microsoft designed a new version of the file system, FAT32, which supported an increased number of possible clusters, but could reuse most of the existing code, so that the conventional memory footprint was increased by less than 5 KiB under DOS. Cluster values are represented by 32-bit numbers, of which 28 bits are used to hold the cluster number. The boot sector uses a 32-bit field for the sector count, limiting the FAT32 volume size to 2 TiB for a sector size of 512 bytes and 16 TiB for a sector size of 4,096 bytes. FAT32 was introduced with MS-DOS 7.1 / Windows 95 OSR2 in 1996, although reformatting was needed to use it, and DriveSpace 3 (the version that came with Windows 95 OSR2 and Windows 98) never supported it. Windows 98 introduced a utility to convert existing hard disks from FAT16 to FAT32 without loss of data. In the Windows NT line, native support for FAT32 arrived in Windows 2000. A free FAT32 driver for Windows NT 4.0 was available from Winternals, a company later acquired by Microsoft. The acquisition of the driver from official sources is no longer possible. Since 1998, Caldera's dynamically loadable DRFAT32 driver could be used to enable FAT32 support in DR-DOS. The first version of DR-DOS to natively support FAT32 and LBA access was OEM DR-DOS 7.04 in 1999. That same year IMS introduced native FAT32 support with REAL/32 7.90, and IBM 4690 OS added FAT32 support with version 2. Ahead Software provided another dynamically loadable FAT32.EXE driver for DR-DOS 7.03 with Nero Burning ROM in 2004. IBM PC DOS introduced native FAT32 support with OEM PC DOS 7.10 in 2003. The maximum possible size for a file on a FAT32 volume is 4 GiB minus 1 byte or 4,294,967,295 (232 − 1) bytes. This limit is a consequence of the file length entry in the directory table and would also affect huge FAT16 partitions with a sufficient sector size. Large video files, DVD images and databases often exceed this limit. As with previous file systems, the design of the FAT32 file system does not include direct built-in support for long filenames, but FAT32 volumes can optionally hold VFAT long filenames in addition to short filenames in exactly the same way as VFAT long filenames have been optionally implemented for FAT12 and FAT16 volumes. OS/2 heavily depends on extended attributes (EAs) and stores them in a hidden file called "EA␠DATA.␠SF" in the root directory of the FAT12 or FAT16 volume. This file is indexed by two previously reserved bytes in the file's (or directory's) directory entry at offset 0x14. In the FAT32 format, these bytes hold the upper 16 bits of the starting cluster number of the file or directory, hence making it impossible to store OS/2 EAs on FAT32 using this method. To accommodate its OS/2 subsystem, Windows NT supports the handling of extended attributes in HPFS, NTFS, FAT12 and FAT16. It stores EAs on FAT12, FAT16 and HPFS using exactly the same scheme as OS/2, but does not support any other kind of ADS as held on NTFS volumes. Trying to copy a file with any ADS other than EAs from an NTFS volume to a FAT or HPFS volume gives a warning message with the names of the ADSs that will be lost. It does not support the FAT32.IFS method to store EAs on FAT32 volumes. Windows 2000 onward acts exactly as Windows NT, except that it ignores EAs when copying to FAT32 without any warning (but shows the warning for other ADSs, like "Macintosh Finder Info" and "Macintosh Resource Fork"). Cygwin uses "EA␠DATA.␠SF" files as well. One of the user experience goals for the designers of Windows 95 was the ability to use long filenames (LFNs—up to 255 UTF-16 code units long) [nb 1] , in addition to classic 8.3 filenames (SFNs). For backward and forward compatibility LFN were implemented as an optional extension on top of the existing FAT file system structures using a workaround in the way directory entries are laid out. Non VFAT-enabled operating systems can still access the files under their short file name alias without restrictions, however, the associated long file names may get lost, when files with long file names are copied under non VFAT-aware operating systems. In Windows NT, support for VFAT long filenames started from version 3.5. GNU/Linux provides a VFAT filesystem driver to work with FAT volumes with VFAT long filenames. For some while, a UVFAT driver was available to provide combined support for UMSDOS-style permissions with VFAT long filenames. OS/2 added long filename support to FAT using extended attributes (EA) before the introduction of VFAT; thus, VFAT long filenames are invisible to OS/2, and EA long filenames are invisible to Windows, therefore experienced users of both operating systems would have to manually rename the files. Human68K supported up to 18.3 filenames and (Shift JIS) Kanji characters in a proprietary FAT file system variant. The FAT file system itself is not designed for supporting Alternate Data Streams (ADS), but some operating systems that heavily depend on them have devised various methods for handling them on FAT volumes. Such methods either store the additional information in extra files and directories (classic Mac OS and macOS), or give new semantics to previously unused fields of the FAT on-disk data structures (OS/2 and Windows NT). Mac OS using PC Exchange stores its various dates, file attributes and long filenames in a hidden file called "FINDER.DAT", and resource forks (a common Mac OS ADS) in a subdirectory called "RESOURCE.FRK", in every directory where they are used. From PC Exchange 2.1 onwards, they store the Mac OS long filenames as standard FAT long filenames and convert FAT filenames longer than 31 characters to unique 31-character filenames, which can then be made visible to Macintosh applications. macOS stores resource forks and metadata (file attributes, other ADS) using AppleDouble format in a hidden file with a name constructed from the owner filename prefixed with "._", and Finder stores some folder and file metadata in a hidden file called " .DS_Store " (but note that Finder uses .DS_Store even on macOS' native filesystem, HFS+). Early GNU/Linux distributions also supported a format known as UMSDOS, a FAT variant with Unix file attributes (such as long file name and access permissions) stored in a separate file called "--linux-.---". UMSDOS fell into disuse after VFAT was released and it is not enabled by default in Linux from version 2.5.7 onwards. For some time, Linux also provided combined support for UMSDOS-style permissions and VFAT long filenames through UVFAT. In its NetWare File System (NWFS) Novell implemented a heavily modified variant of a FAT file system for the NetWare operating system. For larger files it utilized a performance feature named Turbo FAT. FATX is a family of file systems designed for Microsoft's Xbox video game console hard disk drives and memory cards,   introduced in 2001. While resembling the same basic design ideas as FAT16 and FAT32, the FATX16 and FATX32 on-disk structures are simplified but fundamentally incompatible with normal FAT16 and FAT32 file systems, making it impossible for normal FAT file system drivers to mount such volumes. exFAT is intended for use on flash drives (such as SDXC and Memory Stick XC), where FAT32 is otherwise used. Microsoft's GUI and command-line format utilities offer it as an alternative to NTFS (and, for smaller partitions, to FAT16B and FAT32). The MBR partition type is 0x07 (the same as used for IFS, HPFS, and NTFS). Logical geometry information located in the VBR is stored in a format not resembling any kind of BPB. On December 3, 2003 Microsoft announced  that it would be offering licenses for use of its FAT specification and "associated intellectual property", at the cost of a US$0.25 royalty per unit sold, with a $250,000 maximum royalty per license agreement. To this end, Microsoft cited four patents on the FAT file system as the basis of its intellectual property claims. The Public Patent Foundation (PUBPAT) submitted evidence to the US Patent and Trademark Office (USPTO) in 2004 disputing the validity of U.S. patent 5579517,  including prior art references from Xerox and IBM. The USPTO opened an investigation and concluded by rejecting all claims in the patent. The next year, the USPTO further announced that following the re-examination process, it affirmed the rejection of '517 and additionally found U.S. patent 5,758,352  invalid on the grounds that the patent had incorrect assignees. 1 2 3 4 5 6 Since Windows 2000, Microsoft Windows uses UTF-16 instead of UCS-2 for the internal "Unicode". In UTF-16, a "character" (code point) may take up two code units. 1 2 A driver named VFAT appeared before Windows 95, in Windows for Workgroups 3.11, but this older version was only used for implementing 32-bit file access and did not support long file names. 1 2 Sources differ in regard to the first NCR data entry terminal integrating support for the FAT file system. According to Stephen Manes and Paul Andrews, "Gates", development was for a NCR 8200 in late 1977, incorrectly classified as a floppy-based upgrade to the NCR 7200, which had been released in 1975-11 (model I and IV) and was built around an Intel 8080 8-bit processor, but was cassette-based only. However, the NCR Century 8200 was a 16-bit minicomputer, onto which several data entry terminals could be hooked up. Marc McDonald even remembered a NCR 8500, a mainframe of the Criterion series, which can be ruled out as well. Announced 1977-10 for shipment in 1978-02, NCR also introduced the NCR I-8100 series including the 8080-based NCR I-8130 and NCR I-8150 models of small business systems featuring dual floppy disks. Other sources indicate that either the NCR 7200 series itself or the successor series were the actual target platform. NCR Basic Plus 6 (based on Microsoft Extended BASIC-80) became available for the cassette-based NCR 7200 model VI in Q1/1977. The NCR 7500 series was released in 1978, based on a similar 8080 hardware, but now including NCR 7520 and 7530 models featuring 8-inch diskettes. NCR Basic +6, a precursor or adaptation of Standalone Disk BASIC-80 was available for them at least since 1979. One source claims that a special NCR 7200 model variant with two 8-inch diskettes and Microsoft BASIC existed and was imported by NCR Sydney into Australia the least. ↑ See FAT end-of-chain marker for special precautions in regard to occurrences of a cluster value of 0xFF0 on FAT12 volumes under MS-DOS/PC DOS 3.3 and higher. ↑ DR-DOS is able to boot off FAT12/FAT16 logical sectored media with logical sector sizes up to 1024 bytes. NTFS is a proprietary file system developed by Microsoft. Starting with Windows NT 3.1, it is the default file system of the Windows NT family. Disk partitioning or disk slicing is the creation of one or more regions on secondary storage, so that each region can be managed separately. These regions are called partitions. It is typically the first step of preparing a newly installed disk, before any file system is created. The disk stores the information about the partitions' locations and sizes in an area known as the partition table that the operating system reads before any other part of the disk. Each partition then appears to the operating system as a distinct "logical" disk that uses part of the actual disk. System administrators use a program called a partition editor to create, resize, delete, and manipulate the partitions.. Partitioning allows the use of different filesystems to be installed for different kinds of files. Separating user data from system data can prevent the system partition from becoming full and rendering the system unusable. Partitioning can also make backing up easier. A disadvantage is that it can be difficult to properly size partitions resulting in having one partition with much free space and another nearly totally allocated. An 8.3 filename is a filename convention used by old versions of DOS and versions of Microsoft Windows prior to Windows 95 and Windows NT 3.5. It is also used in modern Microsoft operating systems as an alternate filename to the long filename for compatibility with legacy programs. The filename convention is limited by the FAT file system. Similar 8.3 file naming schemes have also existed on earlier CP/M, TRS-80, Atari, and some Data General and Digital Equipment Corporation minicomputer operating systems. Linux has several filesystem drivers for the File Allocation Table (FAT) filesystem format. These are commonly known by the names used in the mount command to invoke particular drivers in the kernel: msdos, vfat, and umsdos. Disk formatting is the process of preparing a data storage device such as a hard disk drive, solid-state drive, floppy disk or USB flash drive for initial use. In some cases, the formatting operation may also create one or more new file systems. The first part of the formatting process that performs basic medium preparation is often referred to as "low-level formatting". Partitioning is the common term for the second part of the process, making the data storage device visible to an operating system. The third part of the process, usually termed "high-level formatting" most often refers to the process of generating a new file system. 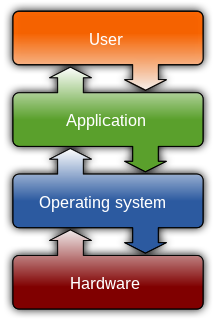 In some operating systems all or parts of these three processes can be combined or repeated at different levels and the term "format" is understood to mean an operation in which a new disk medium is fully prepared to store files. For computer file systems, fdisk is a command-line utility that provides disk partitioning functions. It is available in DOS, FlexOS, OS/2 and Microsoft Windows operating systems. In versions of the Windows NT operating system line from Windows 2000 onwards, fdisk is replaced by a more advanced tool called diskpart. Similar utilities exist for Unix-like systems. In computing, the BIOS parameter block, often shortened to BPB, is a data structure in the volume boot record describing the physical layout of a data storage volume. On partitioned devices, such as hard disks, the BPB describes the volume partition, whereas, on unpartitioned devices, such as floppy disks, it describes the entire medium. A basic BPB can appear and be used on any partition, including floppy disks where its presence is often necessary, however, certain filesystems also make use of it in describing basic filesystem structures. Filesystems making use of a BIOS parameter block include FAT12, FAT16, FAT32, HPFS, and NTFS. Due to different types of fields and the amount of data they contain, the length of the BPB is different for FAT16, FAT32, and NTFS boot sectors. Combined with the 11-byte data structure at the very start of volume boot records immediately preceding the BPB or EBPB, this is also called FDC descriptor or extended FDC descriptor in ECMA-107 or ISO/IEC 9293. This article details various versions of DOS-compatible operating systems. Cylinder-head-sector (CHS) is an early method for giving addresses to each physical block of data on a hard disk drive. GUID Partition Table (GPT) is a standard for the layout of the partition table on a physical storage device used in a desktop or server PC, such as a hard disk drive or solid-state drive, using globally unique identifiers (GUID). Although it forms a part of the Unified Extensible Firmware Interface (UEFI) standard, it is also used on some BIOS systems because of the limitations of master boot record (MBR) partition tables, which use 32 bits for storing logical block addresses (LBA) and size information on a traditionally 512-byte disk sector. Long filename (LFN) support is Microsoft's backward compatible extension of the 8.3 filename naming scheme used in DOS. Long filenames can be more descriptive, including longer filename extensions common on other operating systems such as .jpeg, .tiff, .html, and .xhtml rather than specialized shortened names such as .jpg, .tif, .htm, or .xht. The standard has been common with File Allocation Table (FAT) filesystems since its first implementation in Windows NT 3.5 of 1994. DriveSpace is a disk compression utility supplied with MS-DOS starting from version 6.0. The purpose of DriveSpace is to increase the amount of data the user could store on disks by transparently compressing and decompressing data on-the-fly. It is primarily intended for use with hard drives, but use for floppy disks is also supported. An extended boot record (EBR), or extended partition boot record (EPBR), is a descriptor for a logical partition under the common DOS disk drive partitioning system. In that system, when one partition record entry in the master boot record (MBR) is designated an extended partition, then that partition can be subdivided into a number of logical partitions. The actual structure of that extended partition is described by one or more EBRs, which are located inside the extended partition. The first EBR will always be located on the very first sector of the extended partition. The following tables compare general and technical information for a number of file systems. exFAT is a file system introduced by Microsoft in 2006 and optimized for flash memory such as USB flash drives and SD cards. exFAT is proprietary, and Microsoft owns patents on several elements of its design. The partition type in a partition's entry in the partition table inside a master boot record (MBR) is a byte value intended to specify the file system the partition contains and/or to flag special access methods used to access these partitions. MS-DOS is an operating system for x86-based personal computers mostly developed by Microsoft. Collectively, MS-DOS, its rebranding as IBM PC DOS, and some operating systems attempting to be compatible with MS-DOS, are sometimes referred to as "DOS". MS-DOS was the main operating system for IBM PC compatible personal computers during the 1980s and the early 1990s, when it was gradually superseded by operating systems offering a graphical user interface (GUI), in various generations of the graphical Microsoft Windows operating system. A master boot record (MBR) is a special type of boot sector at the very beginning of partitioned computer mass storage devices like fixed disks or removable drives intended for use with IBM PC-compatible systems and beyond. The concept of MBRs was publicly introduced in 1983 with PC DOS 2.0. A FAT file system is a specific type of computer file system architecture and a family of industry-standard file systems utilizing it. 1 2 3 "File Systems". Microsoft TechNet. 2001. Retrieved 2011-07-31. 1 2 3 4 5 Microsoft (2006-11-15). Windows 95 CD-ROM CONFIG.TXT File Article 135481, Revision: 1.1, retrieved 2011-12-22: "For each hard disk, specifies whether to record the date that files are last accessed. Last access dates are turned off for all drives when your computer is started in safe mode, and are not maintained for floppy disks by default. Syntax: ACCDATE=drive1+|- [drive2+|-]..."
1 2 "FAT File System (Windows Embedded CE 6.0)". Microsoft. January 6, 2010. Retrieved 2013-07-07. ↑ "A brief introduction to FAT (File Allocation Table) formats | Wizcode's articles | HowTos, Guides, Hints and Tips, Articles". www.wizcode.com. Archived from the original on September 25, 2015. Retrieved September 24, 2015. ↑ "Comparing NTFS and FAT file systems". Microsoft. Retrieved 2014-01-27. ↑ JEIDA/JEITA/CIPA (2010). "Standard of the Camera & Imaging Products Association, CIPA DC-009-Translation-2010, Design rule for Camera File system: DCF Version 2.0 (Edition 2010)" (PDF). Archived from the original (PDF) on September 30, 2013. Retrieved 2011-04-13. 1 2 3 4 5 "Microsoft Extensible Firmware Initiative FAT32 File System Specification, FAT: General Overview of On-Disk Format". Microsoft. March 30, 2011. Retrieved 2018-12-21. 1 2 "Volume and File Structure of Disk Cartridges for Information Interchange". Standard ECMA-107 (2nd ed., June 1995). ECMA. 1995. Retrieved 2011-07-30. ↑ "Information technology – Volume and file structure of disk cartridges for information interchange". ISO/IEC 9293:1994. ISO catalogue. 1994. Retrieved 2012-01-06. ↑ "Information processing – Volume and file structure of flexible disk cartridges for information interchange". ISO 9293:1987. ISO catalogue. 1987. Retrieved 2012-01-06. ↑ Reynolds, Aaron R.; Adler, Dennis R.; Lipe, Ralph A.; Pedrizetti, Ray D.; Parsons, Jeffrey T.; Arun, Rasipuram V. (May 26, 1998). "Common name space for long and short filenames". US Patent 5758352. Retrieved 2012-01-19. 1 2 Manes, Stephen; Andrews, Paul (1993). Gates: How Microsoft's Mogul Reinvented an Industry—and Made Himself the Richest Man in America. Doubleday. ISBN 0-385-42075-7. 1 2 3 4 Hunter, David (1983). "Tim Paterson – The roots of DOS". Softalk for the IBM Personal Computer (March 1983). Retrieved 2014-06-02. ↑ Schulman, Andrew; Brown, Ralf; Maxey, David; Michels, Raymond J.; Kyle, Jim (1994). Undocumented DOS – A programmer's guide to reserved MS-DOS functions and data structures – expanded to include MS-DOS 6, Novell DOS and Windows 3.1 (2 ed.). Addison Wesley. p. 11. ISBN 0-201-63287-X. ISBN 978-0-201-63287-3. 1 2 Paterson, Tim (September 30, 2007). "Design of DOS". DosMan Drivel. Retrieved 2011-07-04. 1 2 3 4 Seattle Computer Products (1981). "SCP 86-DOS 1.0 Addendum" (PDF). Retrieved 2013-03-10. ↑ Jenkinson, Brian; Sammes, A. J. (2000). Forensic Computing: A Practitioner's Guide (Practitioner Series). Berlin: Springer. p. 157. ISBN 1-85233-299-9. ... only 2^12 (that is, 4096) allocation units or clusters can be addressed. In fact, the number is less than this, since 000h and 001h are not used and FF0h to FFFh are reserved or used for other purposes, leaving 002h to FEFh (2 to 4079) as the range of possible clusters. ↑ Brouwer, Andries. "FAT under Linux". ↑ Paterson, Tim (1983). "An Inside Look at MS-DOS". Byte. Archived from the original on July 20, 2011. Retrieved 2011-07-18. The numbering starts with 2; the first two numbers, 0 and 1, are reserved. ↑ IBM (1984). IBM PC DOS 3.0 announcement letter. ↑ IBM (1985). IBM PC DOS Technical Reference. First Edition, P/N 6024181, dated February 1985. ↑ Microsoft Knowledge Base article: "MS-DOS Partitioning Summary"
↑ Brouwer, Andries. "List of partition identifiers for PCs". ↑ Brouwer, Andries. "Properties of partition tables". ↑ "Dskprobe Overview: Data Recovery". Microsoft TechNet. March 28, 2003. Retrieved 2011-08-03. ↑ "Errors Creating Files or Folders in the Root Directory". Microsoft Help and Support. December 16, 2004. Retrieved 2006-10-14. ↑ "Windows 98 Resource Kit – Chapter 10 – Disks and File Systems". Microsoft TechNet. 1998. Retrieved 2012-07-16. ↑ "Limitations of the FAT32 File System in Windows XP". Microsoft Knowledge Base. December 1, 2007. Retrieved 2011-08-21. 1 2 README.TXT – Caldera DR-DOS FAT32 Enabled Boot Disk (DRFAT32). Caldera, Inc. July 24, 1998. ↑ Karpowitz, Christina (September 23, 1998). "PowerQuest PartitionMagic 4.0 now available". PowerQuest. Archived from the original on February 8, 1999. Retrieved 2015-04-17. ↑ Livingston, Brian (October 28, 1998). "FAT-32X may operate differently than FAT-32 on large hard drives". 20 (43). Infoworld . Retrieved 2015-04-17. 1 2 Duitz, Neal (July 17, 2001). "Can anyone explain FAT32X?". Win98 Private FAQ, Windows 98 Consumer Preview Program. Archived from the original on June 13, 2004. Retrieved 2015-04-17. 1 2 Costanzo, Lance (May 14, 1998). "FAT32X". Archived from the original on May 21, 1998. Retrieved 2015-04-17. ↑ Steinberg, David (May 1, 1998). "What is a FAT32X partition?". Tech Tip / FAQ. PowerQuest Technical Support. Retrieved 2015-04-17. ↑ Kelder, Henk; (2003); FAT32.TXT for FAT32.IFS version 0.9.13." (): "This byte [...] is not modified while running Windows 95 and neighter [sic] by SCANDISK or DEFRAG. [...] If another program sets the value to 0x00 for a file that has EAs these EAs will no longer be found using DosFindFirst/Next calls only. The other OS/2 calls for retrieving EAs (DosQueryPathInfo, DosQueryFileInfo and DosEnumAttribute) do not rely on this byte. Also the opposite could [...] occur. [...] In this situation only the performance of directory scans will be decreased. Both situations [...] are corrected by CHKDSK". ↑ Kelder, Henk; FAT32.TXT for FAT32.IFS version 0.74 ( "Archived copy". Archived from the original on March 30, 2012. Retrieved January 14, 2012. CS1 maint: Archived copy as title (link)). Comment: This older version of the README file still discusses the old 0xEA and 0xEC magic values. ↑ Eager, Bob (October 28, 2000). "Implementation of extended attributes on the FAT file system". Tavi OS/2 pages. Retrieved 2006-10-14. ↑ "Release notes for v2.5.7". The Linux Kernel archives. March 12, 2002. Retrieved 2006-10-14. ↑ "FATX Specification". free60 wiki. Retrieved 2011-08-16. ↑ de Quincey, Andrew; Murray-Pitts, Lucien (August 29, 2008). "Xbox partitioning and file system details". 0.13. Xbox-Linux project. Archived from the original on June 17, 2010. Retrieved 2014-05-25. ↑ Steil, Michael (February 26, 2008) . "Differences between Xbox FATX and MS-DOS FAT". Xbox-Linux project. Archived from the original on June 17, 2010. Retrieved 2014-05-25. ↑ Microsoft. "exFAT File System Intellectual Property licensing program". Archived from the original on May 7, 2013. Retrieved 2013-04-23. ↑ Udo Kuhnt (July 21, 2011). "DR-DOS/OpenDOS Enhancement Project" . Retrieved 2015-04-20. ↑ "FAT File System". Intellectual Property Licensing. Microsoft. Archived from the original on 2016-09-21. ↑ Garrett, Matthew (January 19, 2012). "EFI and Linux: the future is here, and it's awful". linux.conf.au . YouTube. Retrieved 2014-01-12. ↑ Ravicher, Daniel B. (April 15, 2004). "PUBPAT's Request for Reexamination of Microsoft's FAT Patent" (PDF). Public Patent Foundation . Retrieved 2014-01-12. ↑ USPTO (September 30, 2004). "Patent Office's Office Action Rejecting Microsoft FAT Patent" (PDF). Public Patent Foundation . Retrieved 2014-01-12. ↑ Broache, Anne (January 10, 2006). "Microsoft's file system patent upheld". CNET News. ↑ Paul, Ryan (February 25, 2009). "Microsoft suit over FAT patents could open OSS Pandora's Box". arstechnica.com. Retrieved 2009-02-28. ↑ Fried, Ina (March 30, 2009). "Microsoft, TomTom settle patent dispute". cnet.com. Retrieved 2009-08-22. ↑ "Microsoft Motorola Patent Suit". October 1, 2010. Retrieved 2010-10-02. ↑ Protalinski, Emil (October 1, 2010). "Microsoft sues Motorola, citing Android patent infringement". arstechnica.com. Retrieved 2010-10-02. ↑ Paul, Ryan (July 2, 2009). "New Linux patch could circumvent Microsoft's FAT patents". ArsTechnica.com. Retrieved 2013-10-30. ↑ Brown, Eric (July 2, 2009). "Can FAT patch avoid Microsoft lawsuits?". DesktopLinux.Com. Archived from the original on January 31, 2013. Retrieved 2009-08-23. ↑ Müller, Florian (December 5, 2013). "Federal Patent Court of Germany invalidates Microsoft FAT patent, appeals court may disagree". FOSS Patents. Retrieved 2014-01-12. Microsoft Technet; Volume and file size limits of FAT file systems, copy made by Internet Archive Wayback Machine of an article with summary of limits in FAT32 which is no longer available on Microsoft website. Microsoft Windows XP: FAT32 File System, copy made by Internet Archive Wayback Machine of an article with summary of limits in FAT32 which is no longer available on Microsoft website.